First published in 1972, this set of 9 volumes contains all contemporary British periodical reviews of the first (or other significantly early) editions from 1793 and 1824 of works by William Wordsworth, Samuel Taylor Coleridge, George Gordon Byron, Percy Bysshe Shelley, and John Keats. In addition, a few later reviews are supplied, as well as a substantial number of reviews of other contemporary figures, including William Godwin, Robert Southey, Samuel Rogers, Thomas Campbell, Thomas Moore, Leigh Hunt, William Hazlitt, and Mary Wollstonecraft Shelley. Introductions to each periodical provide brief sketches of each publication as well as names, dates and bibliographical information. Headnotes offer bibliographical data of the reviews and suggested approaches to studying them. The index serves to locate authors and titles reviewed, reviewers, sources of quotations, other people and works mentioned and other proper nouns of interest. 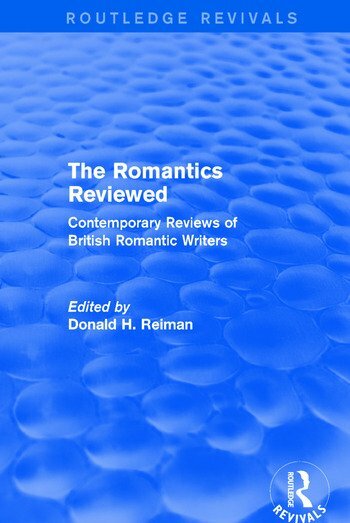 This comprehensive set will be of interest to those studying the Romantics and English literature.